This Nativity is created using a variety of woods in unique shades by Bashir Ahmed, a master craftsman in India. 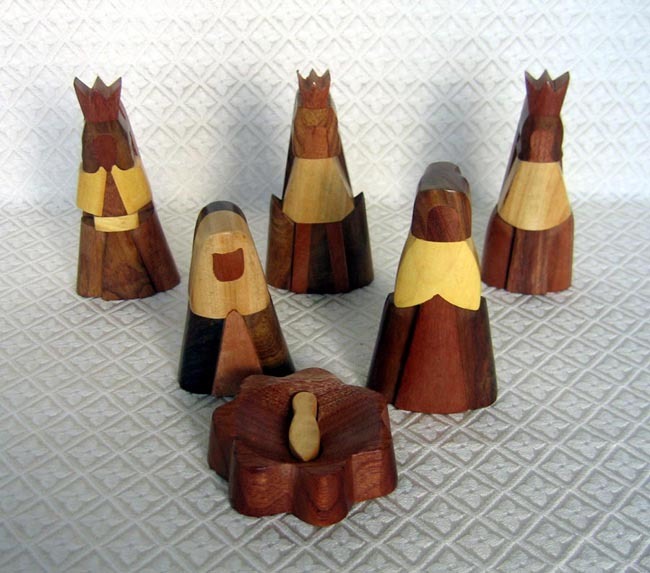 The set includes 6 pieces: the Holy Family and three wise men. The tallest figures measure 5.5 inches tall. The set is distributed by Asha Handicrafts Association. Asha, which means “hope” in Sanskrit, was started in 1975 by a group of Christian businessmen. ASHA restructured in 1985 and today is successfully marketing handcrafts for 50 family workshops and individual artisans irrespective of creed, representing 1500 artisans. As a sign of its commitment to the artisans, Asha welfare workers work closely with the families of the artisans, extending medical care and educational assistance by providing yearly scholarships to children attending primary school, supplying them with school fees, uniforms, and books. Other benefits include interest-free loans, face masks for artisans working with dust or powders, advances to purchase raw materials, and pure drinking water.